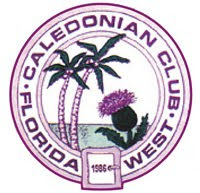 Although a member of the [Presbyterian] Church of Scotland, Gillespie was familiar with The Book of Common Prayer of the Scottish Episcopal Church before he arrived in Sarasota. He was well aware that the first American bishop had been consecrated by Scottish bishops, and that the American church had modeled its first official prayer book after the Scottish revision. He had read the Episcopal service for an Anglican colonist who died in 1887, and from his arrival, he met regularly with a small group of Episcopalians in the Grable community building on Main Street. He sought permission from his father officially to become an Episcopalian, and after tutelage from the Vicar of Christ Church in Bradentown, he was confirmed by The Bishop of Florida, The Right Reverend E. G. Weed, in 1888. 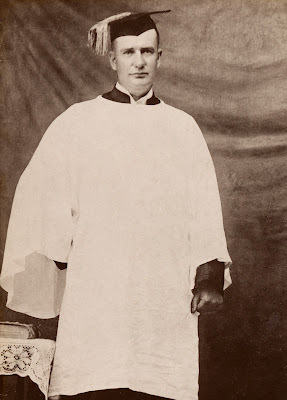 The photo above shows Gillespie vested in surplice and cassock with mortarboard which was appropriate liturgical dress for an Episcopal Lay Reader in 1889. He quickly became a leader of the nascent church in Sarasota, and was appointed Lay Reader by succeeding bishops for several years. The Episcopalians had met in his house, and he donated land from his large yard to build their first, very basic building. Through his nurturing leadership, the church in 1904 became officially recognized as a mission in the Missionary Jurisdiction of Southern Florida by the Bishop, the Right Reverend William Crane Gray. Gillespie was married to Blanche McDaniel in the newly consecrated church in 1905. Although absent for many intermittent years, Gillespie retained an active leadership role in the church to the end of his life. He was a delegate to Diocesan convention on many occasions and was well known throughout Florida as a devoted churchman and considered a prominent leader. The highlight of his long service to the church came in 1922, when he was ordained a Deacon in the Episcopal Church by The Right Reverend Cameron Mann. He had been prepared for ordination by the Rector of Redeemer, the Reverend Francis B. Nash, for whom he had been an assistant until his death in 1923. Looking back at its origins in its centennial year, The Church of the Redeemer renewed its recognition of Gillespie as its principal founder, named its renovated parish hall after him, and established the John Hamilton Gillespie Society to honor his legacy and promote continuing ministries of the Church. 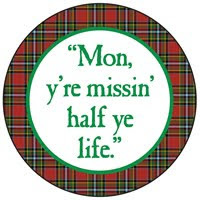 Sources: Oral interviews with Gillespie’s nephew, Charles Swain, in 2003; miscellaneous Gillespie papers in the Church of the Redeemer archives, and chiefly the well documented monograph, John Hamilton Gillespie by Lillian Burns, published by the Sarasota Historical Society.